His head glanced back and forth as the people shuffled by, one hustling traveler after another. His restless feet jostled. The boy was ready and waiting. The lull came. The crowd of luggage and feet disappeared. The wide walkway cleared just long enough. His arms raised. The “ball” zipped across the wide expanse. But it missed its target – a trash can far on the other side of the airport terminal walkway. Dashing after his prized paper wad, feet shuffling with the athleticism of a young basketball player, his hand whisked the make-shift ball from it’s location on the floor back into his possession once again. A missed shot didn’t stop him. The energetic youngster tried again and again, often dodging folks and nearly tripping over a few in an effort to make a basket. It brought a chuckle to my husband and me. Most airline travelers were clueless of the back and forth, bidding-his-time game. They unknowingly became defensive obstacles on the boy’s court. My husband and I were delighted to have court side seats, soaking in pure joy as we watched both defensive and offensive moves unfold before us. I imagine God soaking in similar joy, but in heavenly magnitude, as he watches over us. His eyes placed on us. We certainly held a smile as we watched the youngster, especially as he dodged in and out among travelers. (The near misses, although they birthed a few winces, were the best!) I imagine God, sans winces, smiling too as he looks upon you. Sometimes however, it’s hard to know God is watching, let alone smiling. We wonder if he’s even there. The fog of uncertainly seems too thick. The pace of the race seems too brisk. The struggle of the breath labors too hard. He is our shade. Our protection. He has eyes on you and me and is watching near. PS 121:5 is clear. If you’re at the end of your rope, young mom, hang on. God sees, He is near. Put on the praise, the worship music too. It’s okay if you can’t do it all, He only wants you. So ask for help, or say no here and there. Bask in his presence. Maybe it’s news that you’d certainly not choose. Send back that doctor report. End the hospital stay. Make the bad news simply go away. Yes, I’d love that too. But in the midst of the thunder, the rumbles of blue, remember he’s near. It’s easy to hibernate or go our own way when life pounds hard. (My hand is raised. I often go inward.) But the One who is our protection, our shade, is here. The One who sees and watches us with delight is near. But what if turning inward is actually turning away? 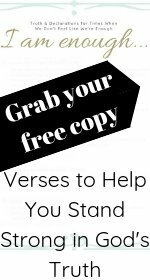 What if it’s stepping outside God’s protective shade? After all, the shadow of a tree does have an end. Its shade goes only so far. 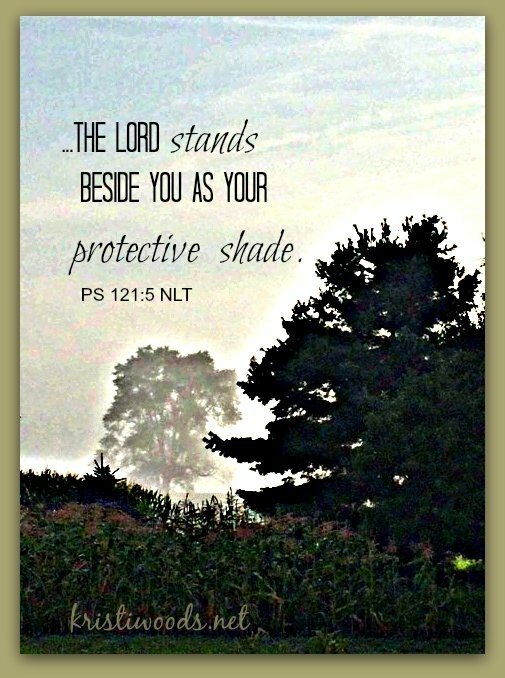 Our choices might very well take us beyond his line of shade, his circle of protection. So what do we do if we’re faced with life’s load, with a paper wad we’d rather not have? 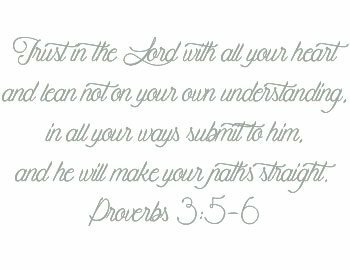 Remember that God is right beside us. Maybe it’s the gift of babysitting, housecleaning, a meal, or simply an ear…the new mom or elderly person down the street will likely find joy as you reach out to them. Likewise, allow others to bless you with their outreach. Don’t be so strong, so “able”. Allow the help of others to be a blessing. In the midst of the heavy, turn outward in praise. Focus eyes on God and others by praying for them, then pray for yourself or the situation. Sometimes we have to look to find anything to be thankful for in a situation, but with God, there is always room for thanksgiving. Start a list, add a few, even add just one or two. Declare the truth. God, you watch over me. You stand beside me and I am protected. Confess your need (for prayer, action, a listening ear) to a friend. Go outward and enjoy God’s protective shade, my friend. He’s watching. An ever-present help….yes! You are a blessing, Jann. Kristi, I love this post! 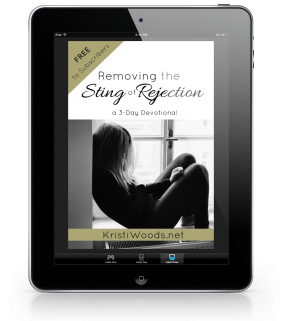 “So what do we do if we’re faced with life’s load, with a paper wad we’d rather not have? Remember that God is right beside us.” So true. Instead of turning inward – be reminded of the shade and protection that He provides. <3 I love the thoughts for action here too – great reminders! Isn’t it true? He’s faithfully right there. A change in perspective changes everything. I’m with you, Tiffany. Did you get the warm and fuzzies concerning that God smile? I did. We’re on the same wavelength, my friend. Horace, praise God. Golly, He’s right beside and knows what we need. His faithfulness astounds me…I think it will even more so when Heaven is home. Come by anytime, Horace. The welcome mat is out. Jenni, I would have done the same if it were my child. But to watch him was a HOOT! It makes me reconsider parenting. 😉 I still don’t know how the youngster didn’t trip anyone up with the way he wove (or is it weaved?!) in and out of “traffic”. Beautiful! I love this reminder that even when we are so caught up in our own days and activities and plans, God is lovingly and gently watching (with the occasional laugh and/or wince, of course). Such a cute story! He’s that anchor for every day. Thanks for visiting, Lauren. I agree with you, Lux. Knowing he’s there makes it all better. Amen, Amen, Amen…and another Amen.